The Ancient Egyptians believed that as long as a pharaoh's name was remembered he would live for all eternity. Tutankhamun also known as King Tut was a minor King. He died when he was only nineteen years old, but the discovery of the tomb of Tutankhamun and its fabulous wealth has made King Tut one of the most famous Pharaohs of Ancient Egypt. This short King Tut Biography provides interesting information about this famous Pharaoh. His birth name, the Sa Ra (“son of the Sun”), Tutankhaten (“the living image of Aten”) later changed to Tutankhamun (“the living image of Amun”). Tutankhamun was born in 1343 BC. Tutankhamun was first known as Tutankhaten, meaning "Living Image of Aten". The background of King Tut encompasses one of the most chaotic periods in the history of Ancient Egypt. It was the time when the lives of all Ancient Egyptians were turned upside down. The father of Tutankhamun was Akhenaten who became known as the heretic king. The religious ideas of his father radically changed Ancient Egypt from a polytheistic religion, worshipping many gods, to monotheism which was the worship of one god - the Aten depicted as the sun disc. The Ancient Egyptians had worshipped the same gods for literally thousands of years - the number of gods they worshipped numbered nearly 2000. The Ancient Egyptians were forced to abandon their old gods and Akhenaten used the might of the Egyptian army to enforce these ideas and destroy the old religion and its priesthood. The entire population of Thebes, numbering over 20,000 people, were moved to the new city of Armana which Akhenaten had built as his new capital. The powerful priests of Amun were expected to worship the sole god Aten. Akhenaten ordered that all images of all other gods were ordered to be destroyed. The traditional temple based economy, run by priests of Amun, had been replaced by the new regime, run by local administrators and military commanders. Tutankhamun was born in 1343 BC. Tutankhamun was first known as Tutankhaten, meaning "Living Image of Aten". He was brought up in the new city of Armana. His father became more and more autocratic as he focussed solely on the new religion. The home and foreign affairs of Egypt were totally neglected. The new regime became corrupt and in 1337 BC, after a reign of 17 years, it is believed that Akhenaten was forced to abdicate and soon after died. A mysterious person called Smenkhkare Ankhetkheperure took the throne (r1336 BC -1334 BC). Then in 1334BC when Tutankhamun was just 9 years old he was made Pharaoh. In the same year Tutankhamun married Ankhesenpaaten, his half sister, the third daughter of Akhenaten and Nefertiti. His regent was Ay who was also the Grand Vizier. Ay was also the father of Nefertiti, his stepmother and also the grandfather of Ankhesenpaaten. The marriage of Tutankhamun and Ankhesenpaaten produced at least two daughters who were stillborn. The great military commander, General Horemheb, was designated as the Boy King's "Deputy" and was recognised as heir to Tutankhamun until the pharaoh produced children of his own. In 1331 BC there was a growing backlash against the new religion and the young pharaoh changed his name from Tutankhaten to Tutankhamun and Queen Ankhesenpaaten changed her name to Ankhesenamun. In 1330BC the royal court moved back to the old capital at Thebes which was the center of worship of the god Amun and the power base of the Amun priests. Tutankhamun commissioned various building works at this time including the restoration of some temple properties at Karnak and Thebes. 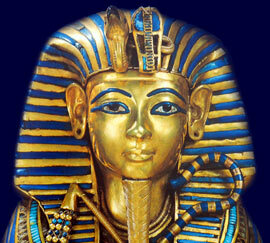 King Tut died unexpectedly in the year of 1325 at the age of 18/19. He reigned for just 9 years and the cause of his death still remains a mystery. He was buried in his hastily prepared tomb in the Valley of the Kings 70 days after his death, according to the death rituals of the Ancient Egyptians. Each section of this King Tut Biography website addresses all topics and provides interesting facts and information about the Golden Age of Pharaohs and of Egypt. The Sitemap provides full details of all of the information and facts provided about the fascinating subject of the Pharaoh King Tut Biography - Tutankhamun!